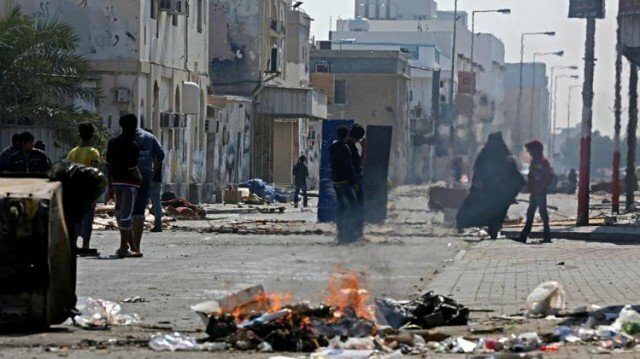 A Bahraini policeman has died of wounds from a bomb blast during protests marking Friday’s third anniversary of the country’s uprising. According to the interior ministry, he was one of two officers wounded in a “terror blast” in the village of Dair. Associated Press quoted the Bahrain Youth Society for Human Rights as saying 38 protesters had been hurt in clashes since Thursday evening, with injuries caused by birdshot fire, tear gas and beatings. The government and opposition have held two rounds of fruitless reconciliation talks, with a third expected soon. The protesters are mostly from poorer, Shia areas in the villages outside the capital. Protesters have repeatedly used burning tyres and other debris as a tactic to block police vehicles from entering Shia areas. Sunni Muslims are a minority in the country but through the al-Khalifa dynasty have ruled over the Shia Muslim majority for more than 200 years.